The latest edition of the Sandberg ”Ajatus on timantti” diamond jewelry catalogue is ready. This edition has the Nordic Swan Ecolabel. The vision of the Nordic Swan Ecolabel is a sustainable society, in which future generations can benefit from the same conditions and opportunities as we ourselves do. An important step towards this vision is for us all, with the help of ecolabelling, to choose the most environmentally-friendly products. The Swan logo demonstrates that a product is a good environmental choice. 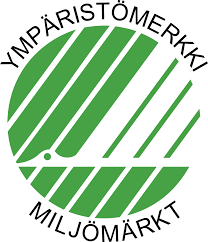 The green symbol is available for around 60 product groups for which it is felt that ecolabelling is needed and will be beneficial. The new catalogue is available at our resellers and at wedding fairs and events all around Finland as of the beginning of February. 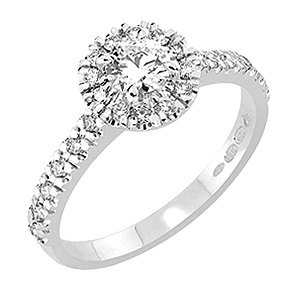 The magnificent Wishing Well V-1790w ring has a pear-shaped halo ornament. The other side of the split shank is straight, so e.g. 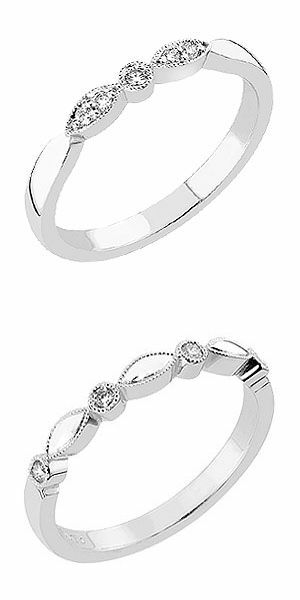 band rings V-720w and V-760w or a plain engagement ring are a perfect match. The halo ornament measures approximately 12 x 9 mm. The center diamond is a 0,55–0,65ct pear-shaped diamond framed by 14 pieces of 0,016-0,018ct brilliants. The ring has altogether 24 side stones. The list price for the V-1790w ring in 18K white gold starts at approximately 5500 € (with a 0,55ct H-si2 center diamond). The new T-24-7w and T-24-5w rings position themselves at the top of our range of band rings. The size of each single diamond in these truly impressive rings is 0,23-0,26ct, so the total weight of the 7-stone T-24-7w ring (pictured) is a grand 1,60-1,80ct and the 5-stone T-24-5w model 1,15-1,30ct. Both models have an approx. 4,8 mm wide shank with a slightly rounded shank. The prices of the 7-stone model start at 7550€ and the 5-stone at 5850€. The Wishing Well collection now includes two new halo rings with a round halo ornament, models V717w and V-722w. As for size and price, these new rings position themselves between our previous round halo ring models. The side stoned shank of the V-717w (pictured) is 2 mm wide. A brilliant cut 0,30-0,40ct diamond can be set as the center diamond, and the total weight of the side stones and framing stones (24 in total) is 0,23-0,26ct. The halo ornament is approximately 8,1 mm in diameter. 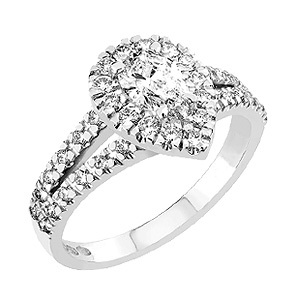 The price of the ring in 18K white gold starts at 3450€ (with center diamond GIA 0,30ct H-vs2-exexex). The V-722w is an alternative model of the V-717w ring without side stones. The width of the rounded shank is approx. 2 mm (also made to order as 2,5 mm wide). The center diamond is 0,30ct-0,40ct and the total weight of the framing stones is 0, 12–0,13ct. The price of the V-722w ring in 18K white gold starts at 3090€ (with center diamond GIA 0,30ct H-vs2-exexex). The V-970w pendant is the largest and most impressive pendant model in the Wishing Well collection. The size of the halo ornament is approx. 9×9 mm. A colored gemstone, approx. 5×5 mm, can be set as the center stone. 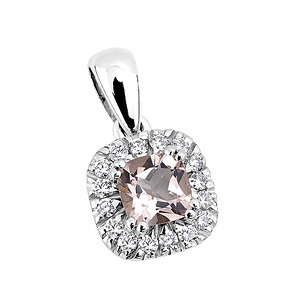 The pendant can also be made entirely of diamonds, in which case the center stone is a 0,60-0,75ct cushion cut or a 0,70-0,80ct brilliant cut diamond. The Kuru ring’s column of black treated diamonds in a black rhodium setting forms a strong contrast and detail on the surface of this engagement ring. 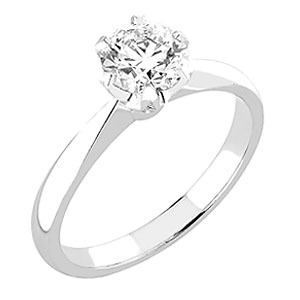 The Kuru setting is available on our 3,8-6 mm wide engagement ring models, both with a flat and a rounded profile. It can also be combined with a Rakka surfaced ring. The ring pictured is the E-550w-Kuru with a 5 mm wide rounded shank and 3 black diamonds approx. 1,5 mm each. The center stone of the Wishing Well rings can now be chosen from two different colored morganites. ”Rose” is light rose-colored (2 pictures at the top, models V-715w and V-975w) and “Peach” has a touch of delicate orange (picture at the bottom, model V-970w). cushion approx. 5×5 mm (goes with models V-970w and V-975w). The M-103w and M-116w are new summery rings in the Summer Wind collection. The total weight of the diamonds in model M-103w (upper picture) is 0,05ct H-vs, and list price in 14K white gold is 769€. The delicate rounded shank of the Summer Wind M-103w band ring is approx. 2,2 mm wide. The 5 diamonds have been set in a pretty millgrain bezel setting. 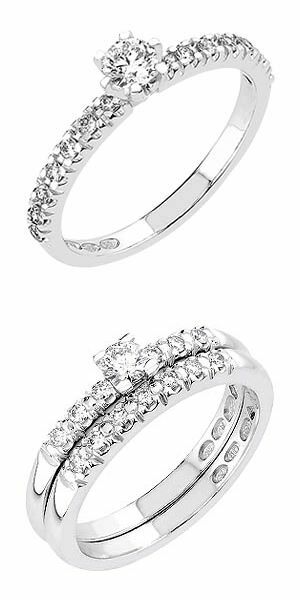 The diamonds in model M-116w (lower picture) are 0,06ct H-vs in total and list price in 14K white gold is 899€. The rounded shank of the Summer Wind M-116w ring is approx. 2,2 mm wide. The four diamonds have been set in a pretty millgrain bezel setting. Both rings are also available in yellow or red gold. 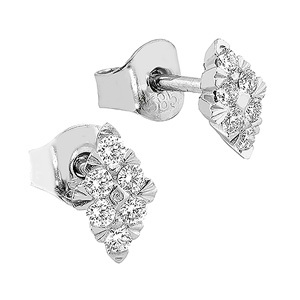 The new lozenge-shaped E-23KKw earrings have 6+6=12 diamonds with a total weight of 0,19ct. The length of the diamond decoration is approx. 7,8 mm. 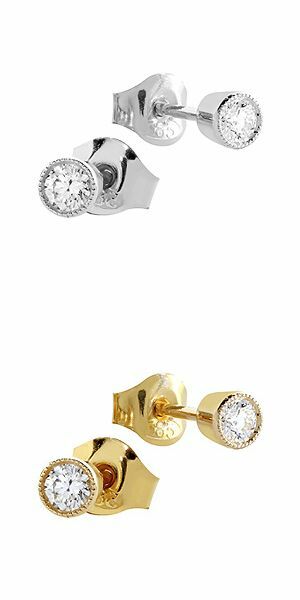 All Wishing Well halo rings with a square halo ornament are also available with the halo ornament placed diagonally on the shank. Pictured, as an example, is the Wishing Well V-710Bw ring with a brilliant cut 0,19–0,25ct diamond as the center stone (0,19ct pictured). The shank is approx. 2 mm wide. There is enough space under the center ornament for a side ring, e.g. band rings V-720w and V-760w are a perfect match. The M-114w rings in our Summer Wind collection are now also available with a combination of colored gemstones and diamonds. Pink sapphires, blue sapphires, rubies and black diamonds stand out nicely in a millgrain setting. Pictured is the M-114w ring with a combination of pink sapphires / rubies and diamonds. Other rings in this collection are also available with colored gemstones. Among the new spring models, it is now our turn to present the new rings in the Summer Wind and Ocean Current collections. At the top is the Summer Wind V-450Bw, which is a perfect match alongside the Wishing Well V-720w band ring (the length of the row of diamonds is exactly the same), but it also goes nicely with e.g. a plain engagement ring. The ring is approx. 2 mm wide. A 0,17–1,10ct diamond can be set as the center stone (pictured 0,17ct). The bottom picture is our new Ocean Current model M-154w pictured together with the matching M-152w band ring of the same collection. The center stone of the M-154w is 0,14ct and the total weight of the diamonds is 0,20ct. The shank is 2 mm wide. To celebrate the oncoming spring, the vintage style Summer Wind ring M-112 will be accompanied by two new similarly styled rings. Model M-110w (upper picture) has diamonds with total weight 0,10ct H-vs, list price in 14K white gold is 1029€. 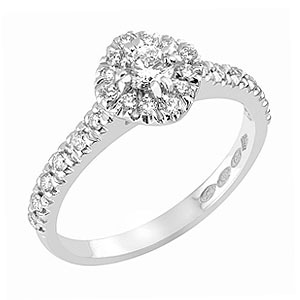 The width of the very delicate rounded shank of the Summer Wind M-110w ring is approximately 1,8 mm. The 11 diamonds have been set in a pretty millgrain bezel setting. Model M-105w (lower picture) has diamonds with total weight 0,08ct H-vs, list price in 14K white gold is 895€. The width of the Summer Wind M-105w band ring’s rounded shank is approximately 2,2 mm. The 5 diamonds have been set in a lovely millgrain bezel setting. The Summer Wind collection now includes new semi-hoop earrings, model number M-214. Total diamond weight 0,14ct H-vs, 14K gold. List price in yellow gold is 1120€, in white and red gold 1170€. The M-214 earrings match nicely with several Summer Wind rings, e.g. M-112, M-114, M-115, M-134. Pictured is the latest addition to the Wishing Well halo ring collection, the V-693w, which has a center piece consisting of 5 small pavé set diamonds. With a list price of 1549€ the new V-693w is the most affordable halo ring in our collection. The V-41w ring in the Horizon collection will soon be available with a smaller, 0,14ct diamond, and with a list price of approximately 1100€. The selection of our solitaire rings will soon include a new ring with a very delicate shank and a four-claw low profile crown setting. 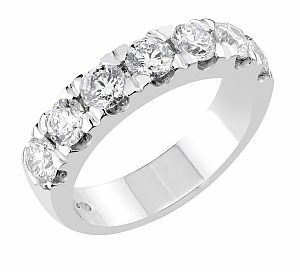 Initially the ring will be available with a 0,10-0,25ct diamond, and later on also with a larger stone all the way up to 0,40ct. The vintage style Summer Wind band ring M-112 will be accompanied by two new similarly styled rings: the M-105 has five stones, and the shank and the setting are the same width as in the M-112. The M-110 ring, with a 1,8 mm wide shank and 0,01ct diamonds, is a more delicate and also a more affordable alternative to the M-112 ring. A stunning new ring with a round halo ornament, the V-980w, is now available at the high end of the Wishing Well halo ring selection. The V-980w ring has a 2 mm wide shank with side stones. A 0,65–1,10ct brilliant cut diamond can be set as the center diamond, the ring pictured has a 1,00ct diamond as the center stone. The total weight of the side stones and framing stones (28 pcs in total) is 0,27–0,29ct. The impressive halo ornament is approximately 9,6 mm in diameter. The list price for the ring in 18K white gold starts at approximately 5500€ (with center diamond GIA 0,65ct H-si2-exexex). 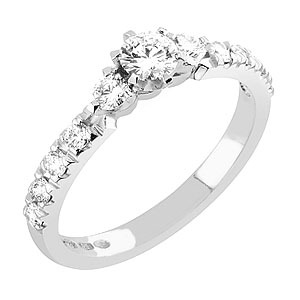 The ring is also available with a 2 mm or 2,5 mm wide shank without side stones. The platinum, uniquely made ring pictured is called “Finnish Maiden 2.0” and has a Flanders cut diamond 1,02ct G-vs2-ex/vg. In addition, the diamond’s setting claws have small round brilliants. The Finnish Maiden ring in white gold and with a 0,30-0,50ct brilliant cut diamond will be available in our collection at the end of 2017. 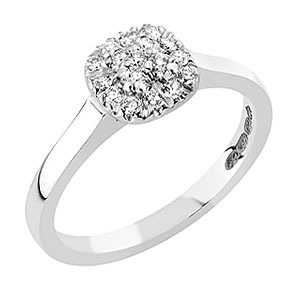 All products in the Sandberg diamond jewellery collection can also be made to order in platinum. The latest edition of the Sandberg ”Ajatus on timantti” diamond jewelry catalogue is ready. Like the two previous editions, also this one is carbon neutral, i.e. the carbon emissions caused by making the paper and the printing process have been fully offset by donating the equivalent sum to a certified climate protection project. The new catalogue is available at our resellers and at wedding fairs and events all around Finland as of the beginning of October. When you see Sandberg diamond jewellery at the jeweller, you will always see it with genuine diamonds. Thus, you can see with your own eyes the brilliance and quality of the diamonds, feel the weight of the precious metal and ensure that the piece of jewellery you buy looks and feels the same as the one you saw in the store. When buying diamond jewellery, it is worth checking with the salesperson whether the piece of jewellery shown has genuine or fake diamonds. It is becoming increasingly common to show imitation model pieces instead of genuine diamond jewellery in stores. In such cases the buyer is unable to see how the diamonds in the jewel he is about to buy/order really look like. Imitation diamond jewellery or model pieces usually have cubic zirconias instead of diamonds. Cubic zirconia is a synthetic material and by far the most common imitation diamond. Cubic zirconias imitate completely clear and grade D i.e. totally colourless diamonds on the GIA scale, and compared to a genuine diamond they often have a stronger dispersion aka fire. Completely clear and colourless diamonds are extremely rare and expensive, thus cubic zirconias in imitation jewellery give a misleading and untrue picture of the diamonds’ quality and appearance when it comes to colour and clarity. Also, the stronger fire of the cubic zirconias may make them look more sparkling and “bling” than the more discreet, elegant substance and brilliance of a genuine diamond. Diamonds make up a significant portion of the value of a diamond jewel – depending on their size, quantity and quality they can make up as much as over 95 % of the price. The grading and quality of the diamonds impact their value as well as their beauty. Thus, it is essential to view the diamonds and their beauty with your own eyes when purchasing diamond jewellery. It is always worth asking whether you are being shown the genuine product or an imitation. A Sandberg diamond jewel is always genuine. The latest addition to the Wishing Well collection is the V-960w ring with a pear shaped halo ornament. At the center of the halo ornament shines a 0,30ct pear shaped GIA diamond, and the total weight of all diamonds starts at 0,55ct. 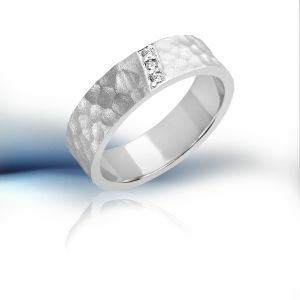 The ring is made of 18K white gold and the list price starts at approximately 3000€. 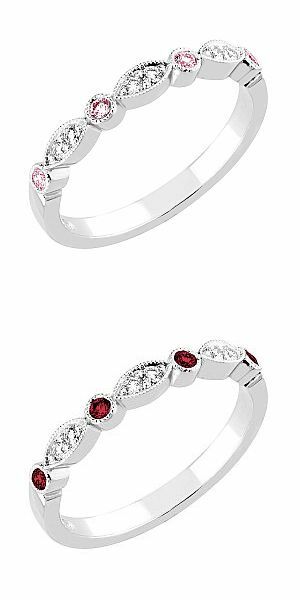 This ring is a great match with the Wishing Well half alliance ring V-720w and with the alliance ring V-725w. The Summer Wind collection now includes three new rings with center stones. The total weight of the diamonds in model M-132w (pictured at the top) starts at 0,32ct H-vs, price from 1995€. The M-132w side stones are set in round, millgrain detailed settings. 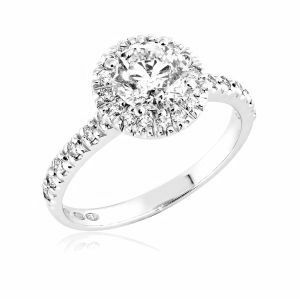 The center diamond of the ring pictured is 0,18ct (center diamonds start at 0,14ct). The total weight of the diamonds in the M-134w (middle picture) starts at 0,26ct H-vs, with price starting at 1795€. The M-134w side diamonds are set in round and marquise shaped decorative sections with millgrain edges. The center diamond of the ring pictured is 0,14ct. 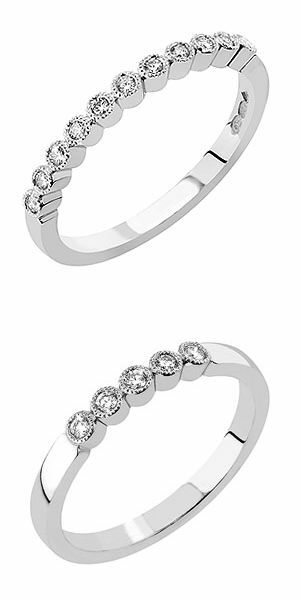 The total weight of the diamonds in the M-140w (bottom picture) starts at 0,26ct H-vs and the price starts at 1695€. The setting of the side stones in the M-140w ring has a millgrain edge. The center diamond of the ring pictured is 0,18ct. Matching band rings are the Summer Wind M-112w and M-114w. The rings in the Horizon collection are now available also with a delicate 2,1 mm wide shank. 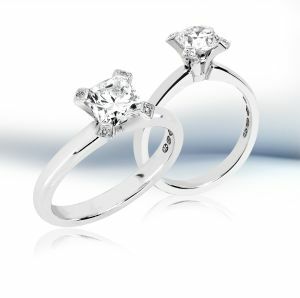 The new V-41 rings are available with a 0,23-1,10ct diamond. The Rakka engagement rings are followed by the diamond decorated Johka ring. The sparkling diamond band in the middle of the hand worked Rakka surface is like a small fell stream which has cleared its way through the endless rocky wilderness on its way to the great waters of the world. 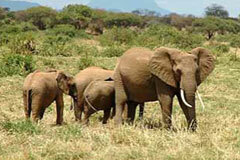 Thus, the name Johka. 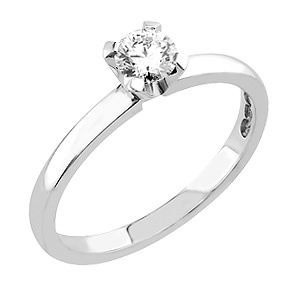 The Johka ring is available with a 4, 5 or 6 mm wide shank with a flat or rounded profile. The Johka/E-260w ring pictured has a 6 mm wide flat shank and the total weight of the 3 diamonds is 0,035ct. Due to the different widths and shank profiles it suits both women and men. To accompany the Summer Wind rings the collection now includes the M-200 stud earrings with sparkling brilliants (total weight 0,21ct) in millgrain decorated bezel settings. The new Tailwind K-270w band ring has 7 pieces of 0,10ct H-vs diamonds, total weight 0,70ct. 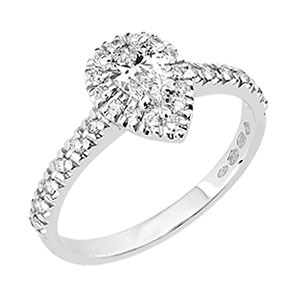 The ring is approximately 3,7 mm wide with a solid flat shank. 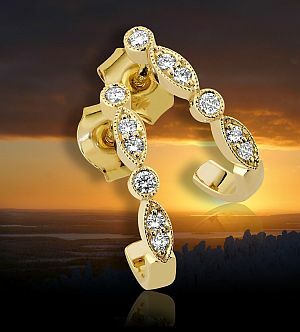 It is made in 18K gold and made to order also in 14K gold or platinum. 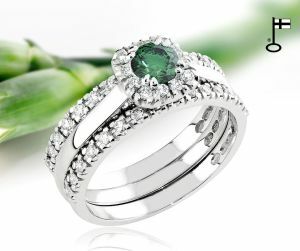 The center stone of the Wishing Well ring V-733w pictured has a lovely forest green treatment. The weight of the forest green diamond pictured is 0,33ct and the weight of the other diamonds in total 0,12ct H-vs, list price 2695€. On both sides of the ring are half alliance rings V-720w (0,15ct H-vs, 1165€ each). Because of its hardness a coloured diamond is an excellent choice for a ring that is used daily and for a long period of time. May we introduce you the next novelty of the spring: the Solar Wind V-460w ring. The center diamond can be 0,20–0,26ct, the larger side diamonds are 0,05–0,06ct and the side diamonds on the shank (8 pcs) are 0,027ct. The width of the rounded shank is approximately 2,5mm and it is made of 18K gold. 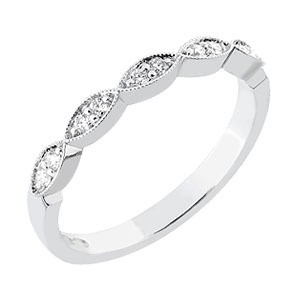 The ring is designed to be worn next to the Wishing Well V-760w band ring (the length of the row of diamonds is exactly the same in both), but it also looks great alongside e.g. a plain engagement ring. 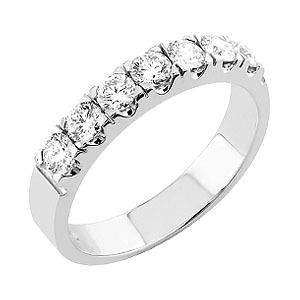 The list price for the V-460w ring in 18K white gold starts at 2959€ (with total diamond weight of 0,54ct H(W)-vs). Among our Summer Wind collection’s vintage style rings is the new M-115w ring. The 10 diamonds, total weight 0,11ct, sparkle in a delicate millgrain setting. The slightly rounded shank is approximately 2,2 mm wide. The M-115w ring – like all the other Summer Wind rings – look beautiful also in yellow or red gold. Several beautiful new models have been added to our collection during the beginning of this year. These include 3 romantic rings, earrings and a pendant in the Summer Wind collection, a classic and impressive half alliance, a pretty framed ring to accompany the Moonlight solitaire rings and a halo ring with a marquise cut center stone. The Summer Wind V-161w ring, with a 0,19ct Flanders cut diamond in a millgrain setting as the center stone, list price 2249€. T-21w half alliance, total weight of the 9 diamonds is 0,55ct and list price 2695€. The Wishing Well V-933s halo ring with a marquise cut center diamond, list prices starting at 2700€. The most delicate solitaire ring in the Wishing Well collection is now available also with a princess cut diamond and four clawed crown setting. The shank of the K-248w ring is approximately 2,3 mm wide and it is rounded. 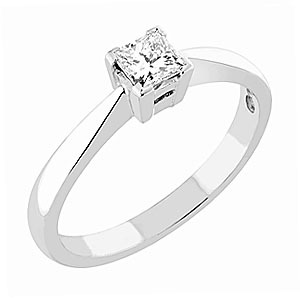 The ring is available with a 0,23–0,31ct princess cut diamond (pictured 0,25ct). All Sandberg diamonds over 0,30ct come with a grading report and laser inscription.